TORONTO, Ontario (June 1, 2009)  SOAKED, a Make-A-Wish® charity event, will be rockin and rollin in Toronto on Saturday, June 27, 2009. 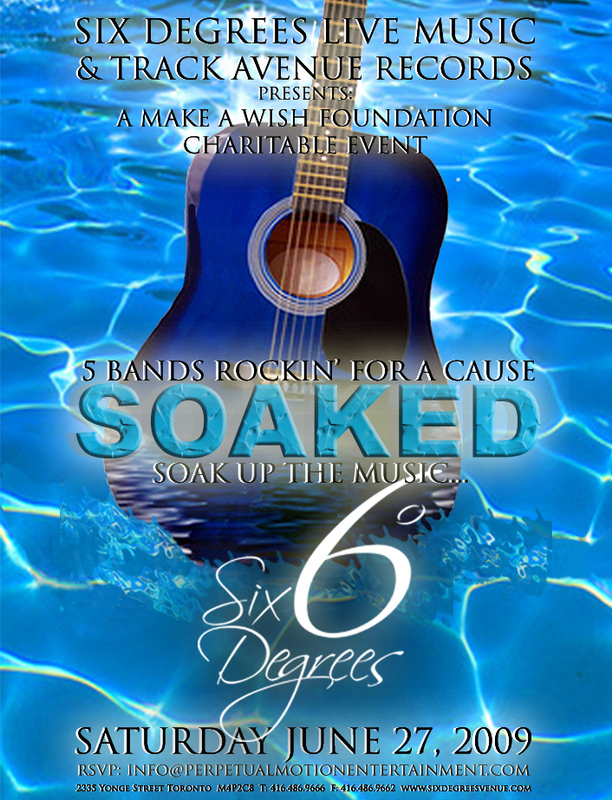 The charity event, hosted by Track Avenue Records, Six Degrees Foundation, Sole Power Productions, ASD Marketing & Entertainment and Perpetual Motion Entertainment will be held at Six Degrees Event Venue located at 2335 Yonge Street (East side of Yonge Street, just north of Eglinton Avenue). Doors open at 9:30 p.m. This event will raise funds to help grant the wishes of children living with life-threatening medical conditions as well as showcase diverse musical talent. As the first of many charity events to come, Track Avenue Records is excited to launch their companys charitable initiative with SOAKED and have the opportunity to partner with industry veterans like ASD Marketing & Entertainment, Sole Power Productions, and Perpetual Motion Entertainment in order to give back to the community. The event will feature five talented bands, djs and an informational component to educate the public about the Make-A-Wish Foundation. A supporter of local and national charitable causes, Six Degrees Foundation, Established and chaired by Marketing Director Rod R. is proud to be a partner in this event. This foundation seeks to better our community by raising awareness of worthwhile causes through charitable events. We are pleased to support this Make-A-Wish event. I encourage everyone to join us for a night of great music and help us make some dreams come true, said Rod R.
With 2 floors of uniquely intimate space and 12,000 square feet of VIP areas, The Event Venue is undoubtedly midtown Torontos destination and serves as the perfect backdrop for this event. In this fun and sophisticated atmosphere, guests will soak up the music from the venues central stage and will have the opportunity to visit the charitys kiosk, where Make-A-Wish volunteers will provide information about the organization. Tickets can be purchased in advance starting from $10.50. To purchase tickets, please visit the Track Avenue Records website at trackavenue.com. THINK YOU HAVE WHAT IT TAKES TO HOST ONE OF OUR EVENTS? CLICK HERE!